Here's a seasonal salad that's sure to delight. Roasting brings out the sweetness of these quintessential fall vegetables, making these already sweet vegetables taste even sweeter. Add some feta cheese and pumpkin seeds, along with a tangy dressing and you're set to go. Serve this either as a side, or scoop some up and serve on top of a salad of mixed greens. Preheat oven to 425F. 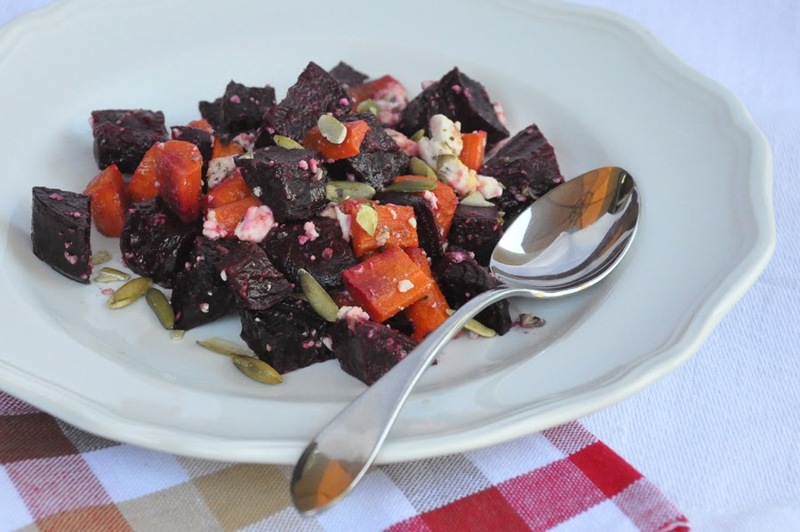 Place beets and carrots on a baking sheet and roast until tender, about 20 minutes. Check for tenderness by piercing vegetables with a fork. Remove from oven when tender and let cool. Cut the carrots into 1/2 inch lengths. Add the feta and pumpkin seeds. Toss with salad dressing and serve. Note: Smaller carrots probably don't need cutting at all. Cut larger carrots either in half or quarter lengthwise, depending on size. What we're aiming for is to have all the vegetables about the same size, so that they cook in the same amount of time. Stealthy Cooking Tip: The darker the vegetable, the greater the health benefits. Beets and carrots are both deep, dark colored vegetables and their nutrient count is great! Beets are high in betacyanin and fiber, together believed to be useful as cancer fighting agents. Carrots have the highest vitamin A of all the commonly consumed vegetables. The antioxidants in beets are believed to protect against cardiovascular disease and cancer. Put the two together for good taste and good health.